iOS developer Guilherme Rambo has discovered a reference to a 4K HDR display mode in the HomePod's firmware, lending credence to rumors that Apple is testing a fifth-generation Apple TV capable of streaming 4K resolution video. HomePod doesn't have a display, and iOS devices lack the resolution for native 4K playback, so the discovery likely pertains to the Apple TV. Rambo also discovered strings kCADisplayModeDolby and kCADisplayModeHDR10, suggesting that a 4K Apple TV could support both the Dolby Vision and HDR10 color formats for high-dynamic-range video. Apple has also listed select movies as 4K and HDR in iTunes purchase history, at least in Canada and the United Kingdom. The content is still only playable in standard definition or HD, which varies from 720p to 1080p, but Apple could be preparing to offer iTunes content in 4K HDR for its new Apple TV. Another developer Jeffrey Grossman‏ also spotted a possible reference to an Apple Watch with LTE support. The string, which refers to GizmoPreservingeSIM, lends credence to a report yesterday that claimed Apple Watch Series 3 models will feature cellular connectivity for use without a paired iPhone. The relevant bit of that string is the mention of a SIM, as the Apple Watch Series 3 would presumably have an embedded SIM card if it had cellular connectivity. Another string mentions GizmoRadioBundleIdentifier, which could refer to the Apple Watch Series 3's cellular radio, reportedly to be supplied by Intel. For those unaware, in 2015, The New York Times reported the Apple Watch was codenamed Gizmo internally. Inside Apple, members of the team that worked on the watch product, code-named Gizmo, say it was a difficult engineering challenge. Last week, Apple seeded an over-the-air firmware file for the HomePod, revealing that it will run a slightly modified version of iOS. The pre-release software is said to correspond with iOS 11.0.2, and it contains references to several unreleased features that would normally be redacted before a public release. The firmware contains a payload that can be unpacked into a filesystem using a few developer tools, giving anyone skilled enough the ability to search through thousands of strings in the software using Terminal commands and disassembly apps like Hopper. For the past eight days, that's exactly what's happened. Since the HomePod firmware is based on a full iOS stack, many discoveries have been made not only about the smart speaker, but also potentially about the so-called iPhone 8, Apple TV, and Apple Watch. Thanks to the HomePod firmware, we know that that the iPhone 8's front camera may record 4K video at 60 FPS, and that its infrared facial recognition capabilities may work with Apple Pay. The firmware also revealed a glyph of an iPhone 8 with a full-front display with a notch at the top for the earpiece and sensors. As for the HomePod itself, it's been discovered that the smart speaker's multi-color LED waveform visible when interacting with Siri measures in at 272×340 pixels. HomePod also appears to have 1GB of RAM, and some of the speaker's sound effects were found buried in the firmware. HomePod doesn't launch until December, so the firmware was likely released by accident, under the identifier AudioAccessory1,1. 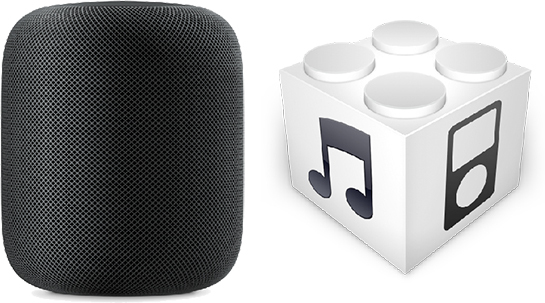 Update: MacRumors discovered the string J105a in the HomePod firmware, consistent with the fifth-generation Apple TV's internal codename first revealed by Bloomberg reporter Mark Gurman in February. Let’s all take a minute and bow our head to the Apple engineer who blessed us with these goodies. Amen. Better pray he finds a new job soon if he gets fired. Jeez, someone really dropped the ball. No way, Apple is eating this up. What better way for them to promote their own upcoming (but still unreleased) products than by 'leaking' some information through another unreleased product? Trust me, Apple knew full well the HomePod's coding would be picked apart by devs. And the internet always loves a good easteregg hunt. It keeps HomePod in the headlines, keeps the hype train running, and comes directly from Apple. It's a win-win in my opinion. Is the HomePod firmware Apple’s biggest ever leak? It’s revealed so much about more than one upcoming product. Somebody is kicking themselves hard for this, if Cook’s not doing it for them. I think the iPhone 4 is the biggest Apple leak ever. Dolby Vision support on the new Apple TV is excellent news. I was wondering about this after news broke about the next Apple TV supporting 4K. Dolby Vision is the cherry on top for me. Seals the deal. Wow. Very impressed how much information we have received from a simple firmware. It's "magical" Jony Ive's voice. Man, I'm about to drop some money for the fourth quarter. My wallet is getting nervous. Next leak, Steve Jobs is still alive and kept in the basement of one infinite loop. Seriously though these Homepod firmware leaks are crazy. An update for an unreleased product that contains all of this, Apple can’t complain about leaks now, they directly leak as much as other sources at this point! "Apple's complete product roadmap for fall 2017, 2018, and 2019 discovered in HomePod firmware"
With the HomePod, a (possibly) redesigned cellular Apple Watch, and 4K AppleTV on the way, it's going to be a Very Merry Apple Christmas indeed!